If thinking of Roppongi Hills, You pay your attention to the super high observatory, don’t you? But this time, I’d like to talk about the GROUND of Roppongi Hills. I also have a humorous photo at the bottom! 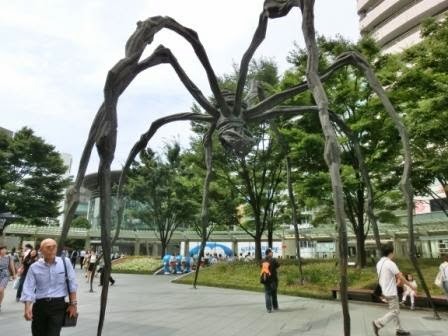 First, there is a very big spider sculpture just next to Roppongi Station and Hills Building. Many visitors take a photo here. Roppongi Hills has some interests in arts, so you will find artistic sculptures, benches, etc.Next is my recommendation. Near the spider, there is a small garden with roses, trees, etc. 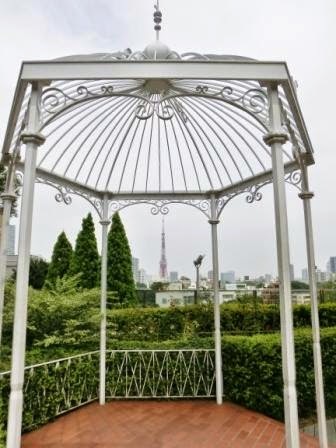 If you want a Romantic Photo with Tokyo Tower, this is definitely the best spot! Beautiful, isn’t it? If only it was a clear sunny day! This place is on the right in the spider photo above. Don’t miss it. 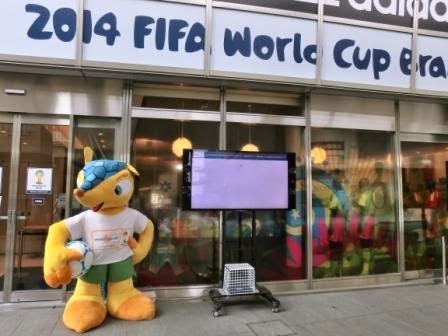 There was a temporary football shop after FIFA World Cup 2014 Brazil. A big Fuleco!TV Asahi, one of the Japanese biggest TV stations, has its central office in Roppongi Hills. 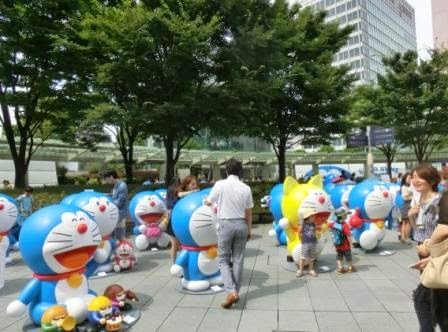 One of their most popular programs is Doraemon, a Japanese manga which is about the blue robot and a boy Nobita, so they put so many Doraemons in front of Roppongi Hills to attract children in summer vacation. So popular among visitors and workers.The last photo is the most humorous of all. This pink door is Dokodemo Door, one of the most well-known items of Doraemon. It enables us to go anywhere we wish to go. Fantastic door! Mother, Father and their boy?NO! The man with a backpack is a single visitor. 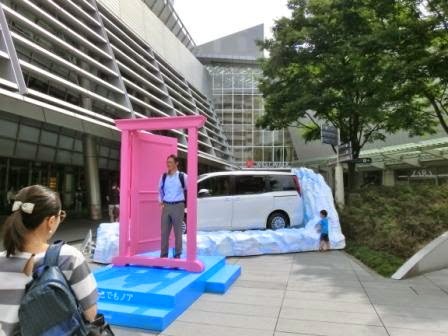 He asked a staff member to take his photo with Dokodemo Door. Great smile! that childlike senses made our life colorful. I have grown up, but I don’t want to hesitate humors!! Thanks for reading and my next post will be about Shibuya again! I talk about variety of stories and I was pretty surprised you found THIS post. Roppongi Hills has changed since I wrote this, but the big spider and Tokyo Tower never move!